Summer is a great time to live in Washington. It’s also a great time to eat fresh fruits and vegetables grown here in our state! 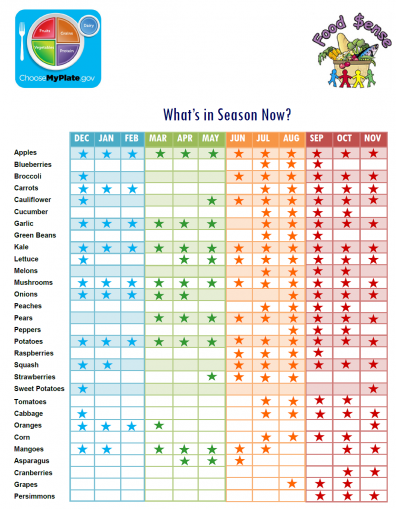 You may have heard about “seasonal eating” before, but what does it mean? Eating fruits and vegetables “in season” means that you are purchasing and eating foods around the same time that they are being harvested from farms in our region. Seasonal eating has many benefits. One of the most important is that buying fruits and vegetables in season is often much more affordable. When you buy a fresh peach in December, that peach has most likely made a long trip from where it was grown to your local grocery store. A higher price is usually charged for that peach, because you are not only paying for the peach itself, but also for the journey the peach has made from the farm where it was picked. That peach might travel all the way from Central or South America, where it is actually warm enough in December to grow peaches. That’s a long trip, with many costs along the way! Those costs are then rolled into the price you pay at the grocery store. When you buy a peach in August, it’s possible to get one grown on a farm here in the Pacific Northwest. With a shorter journey from farm to market to your home, the peach will likely cost you less in August than in December. Fruits and vegetables in season from Washington farms show up in your local grocery store only a day or two after harvesting. If you shop at a farmers market, the produce you buy has often been picked that very same day. In addition to lower prices, in season fruits and vegetables are at peak freshness, flavor, and nutrition. Your SNAP benefits can now be used at many farmers markets in our area. Several farmers markets are also participating in the Fresh Bucks program, which matches the first $10 of SNAP/EBT benefits. For every $2 you spend, get $2 more to spend on fresh fruits and vegetables. Currently there are 21 locations that will double your EBT money with Fresh Bucks. Find out more on freshbucks.org. Better taste, better nutrition, and a better price…what’s not to love about seasonal eating? Check out the table below to learn when your favorite fruits and vegetables are in season!